San Diego Carpet Cleaner Helps You! How Do I Remove That Stain From my Carperts? Regardless of the cause of the problem, the first step to removing stains from carpet is to blot up as much of what is causing the stain as quickly as possible. The next step is to treat the stained carpet with a cleaner that is appropriate for the specific carpet fiber and the substance creating the discoloration. Water and a mild detergent will remove most stains, although other cleansers like vinegar, ammonia, or an off-the-shelf product may be more effective in some cases. Carpet may be made of natural fibers, such as wool, or synthetic fibers, like olefin. Not all cleaning products are considered safe for use on all types of fibers; ammonia, for example, should not be used on wool carpets. If you know what kind of carpet you have, check the manufacturer's website to find out what types of cleaners should not be used. If you don't know, test the cleanser on a small, inconspicuous area first. Many carpets are made of yarns that are very stain resistant, so most spills should be cleaned relatively easily. For very tough or big stains, or if you are worried about damaging your carpet, you may want to contact a professional carpet cleaner like Peninsula Carpet Care. For most spills, quick action and clean water are all that is needed to remove a stain or prevent it from setting in. Cleaning up the spilled matter immediately decreases the chances that it will cause permanent damage to the carpet. First clean up any solid matter and then use a clean, dry cloth to blot at the spill until as much as possible has been lifted. When it's clear no more of the spilled product can be removed through simple absorption, treat the spot by blotting it with a damp cloth or sponge and lukewarm water or club soda. Scrubbing or rubbing the stained area is not recommended, because it may weaken the carpet fibers and cause the stain to spread or become more deeply embedded in the fibers. Blotting gently — beginning at the outer edge of the discoloration and working inward — is considered the safest way to clean the spot without causing additional damage. Wicking — in which a stain appears to have been thoroughly cleaned, only to reappear a day or two later — may occur when substantial liquid has pooled at the base of the carpet. Even though the spill initially appears to have been cleaned, only the surface actually has been. This allows the remaining liquid to work its way back up the carpet fibers to the carpet surface, causing discoloration to reappear. Wicking can be prevented by covering the area with a thick, clean cloth or several plain paper towels and weighing down the pile with books or another heavy object. The weight should be left overnight to allow time for the remaining liquid to be absorbed, after which the carpet can be cleaned appropriately. For most stains caused by food, blotting the stain alternately with a solution of liquid dish detergent or non-bleaching laundry detergent and water followed by a mix of 0.25 cup (62.5 ml) vinegar and 1 cup (250 ml) water can clean the carpet. After blotting the spill to absorb as much liquid as you can, apply a small amount of the detergent solution to the area. Let it stand for several minutes, then blot the stain to remove as much as you can. Follow this with a small amount of vinegar solution; let stand for several minutes, then blot it up. These steps can be repeated as long as the stain appears to be lightening each time. End with the vinegar solution treatment, which will remove any residual detergent from the carpet. Some foods, like berries, ketchup, or colas, can be removed more easily if treated with ammonia first. A mix of 1 tablespoon (about 15 ml) clear ammonia in 0.5 cup (125 ml) of water should be sprayed onto the spot until it is saturated. The ammonia mix should be blotted away, then any remaining stain can be treated with the detergent solution and vinegar. Ammonia can act as a bleaching agent, so it's best to use it only on light-colored carpets. To treat a red wine stain, start with club soda; add a little to the spot and blot with a clean towel. This can be followed with the solution of vinegar and water (0.25 cup (62.5 ml) vinegar and 1 cup (250 ml) water), which should be blotted and then rinsed with warm water. 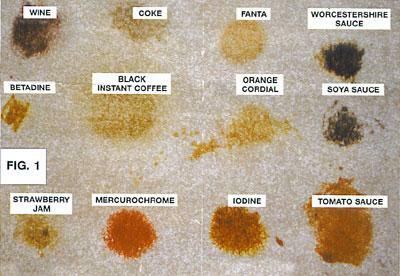 If there is still a stain, it can be treated with the detergent solution. After this has been blotted up, any remaining stain can be treated with a mix of 1 tablespoon (about 15 ml) hydrogen peroxide mixed with 1 cup (250 ml) water; the hydrogen peroxide solution should be applied to the stain then covered with a towel for about 30 minutes. Like ammonia, hydrogen peroxide can bleach the carpet, so it's best to use it only on light colors. If the stain is still not removed, try the ammonia solution (1 tablespoon (about 15 ml) clear ammonia in 0.5 cup (125 ml) of water), followed by vinegar and water. For oily foods and other greasy items, start with a solution of mild detergent and water. After letting it sit for a few minutes, blot the stain to remove as much as you can, then apply a small amount of warm water to rinse the detergent out. If this does not remove the stain, using a clean cloth dipped in dry cleaning solvent or rubbing alcohol may work. It's important to rinse the carpet after each treatment, as the solvent or alcohol can cause damage if left on too long. Do not allow the solvent or alcohol to come into contact with the carpet backing as it can break down the latex that holds the carpet together. Pet urine stains can be treated with water or club soda, then a mix of mild detergent and water. If the spot has not been eliminated, spray it with the ammonia and water solution (1 tablespoon (about 15 ml) clear ammonia in 0.5 cup (125 ml) of water), blot the stain, then spray it with a vinegar and water mix (0.25 cup (62.5 ml) vinegar and 1 cup (250 ml) water). Tough stains may respond to the hydrogen peroxide and water mix (1 tablespoon (about 15 ml) hydrogen peroxide mixed with 1 cup (250 ml) water), which needs to sit for at least 30 minutes. To remove blood stains, first treat the spot with the ammonia solution (1 tablespoon (about 15 ml) clear ammonia in 0.5 cup (125 ml) of water) to neutralize it. Once this has been blotted up with a towel, follow with a small amount of the mild detergent mixed with water; if this appears to be working, repeatedly apply the detergent and blot it up, then follow with a cool water rinse. A hydrogen peroxide and water solution (1 tablespoon (about 15 ml) hydrogen peroxide mixed with 1 cup (250 ml) water) can be used on tough blood stains; remember that it will need to sit for 30 minutes to an hour. All solutions used to treat blood should be cool, as warm water will cause the stain to set and become permanent. Wax that has dripped onto carpet fibers can be removed using both cold and heat. Applying ice to the wax will cause it to become brittle, and once frozen, it can be chipped out carefully with a knife and vacuumed away. If this does not allow you to remove all of the wax, place a clean, dry cloth over the spill area and using a warm steam iron on the cloth to melt the wax. Once melted, the wax will be absorbed into the cloth. Be sure to only heat the iron hot enough to melt the wax; if the iron is too hot, it can burn the carpet.